On Syphilus the dreadful Lot did fall. I know that trying to read the text in the above image is a bit like trying to read the compact edition of the Oxford English Dictionary without a magnifying glass. (You can see a larger version by clicking.) The point of the above is that if you typed how to write an email to your professor into Google this evening (as one visitor did), my blog post on how to e-mail a professor was the first of 98,500,000 results. Life is hard enough when you try and you choose to at least try to do your best. It is much much much harder on those who do NOT try. Paradoxically, the EASIEST route through life is the path that chooses hard work and constant devotion to doing your best. Why is this? It's because life is difficult, and those who fully accept that life is difficult, and then choose to do their best in response, they paradoxically discover that for them, because they have developed the habit of always trying to do their best, for them life paradoxically becomes easier. But it only becomes easier for those who truly accept life's difficulty and meet it head on. Rob says that he's repeating an idea that he read somewhere, possibly in M. Scott Peck's The Road Less Traveled, but as he also says, Who cares? The advice is good, and I'm glad that it came into my mailbox. Thanks, Rob. Review of Eliot Kleinberg, Black Cloud: The Great Florida Hurricane of 1928, and Robert Mykle, Killer 'Cane: The Deadly Hurricane of 1928. In 1928, thousands stayed in the interior. People asked many times, “Why didn’t they flee?” Now people are asking the same questions about New Orleans. The answer in both cases is the same. For many people, fleeing just wasn’t an option. As in Katrina, many of the victims were poor -- in this case, poor migrant workers. While Katrina's targets had the option of an Interstate highway system, those along Lake Okeechobee had the option of following a winding 2-lane road north or taking the road to the coast -- the last place anyone would want to go with a hurricane bearing down. And the vast majority didn't have access to a car, much less own one. Oprah informs us that she believes Zora would "shout" if she could see what had been done with her novel. When I reached the end of the movie, two and a half hours later, I realize Oprah's introductory words are the truest experience of the evening. Yes, praise God, Zora would be shouting, but would it be a shout of glee that her work had finally been mass-produced and commercialized, or would it be a death-scream of betrayal, as all the juicy Africanisms of her book, all the tasty and trashy bits of black culture were sandblasted and filed down to a smooth dish of caramel custard? And StormTracker 3 is there! To bring you, of course, the latest updates. Many people assume X covers all the expenses for Y however, the reality is - it cannot. That's a fused sentence or run-on sentence, two sentences run together with no punctuation between them. Add a comma before however and you get a comma splice, another serious sentence problem. (In formal writing, a comma works to join sentences only if it's followed by a co-ordinating conjunction -- and, but, for, nor, or, so, or yet.) What's really needed in the above sentence is a semicolon, the punctuation mark whose main job is to join complete sentences that express related ideas, Semicolons are often to be found before such words as however, nevertheless, and therefore. Many people assume X covers all the expenses for Y; however, the reality is - it cannot. Part of the problem is that three nouns -- expenses, Y, and reality -- fall between it and X, its antecdent. Another problem is the awkward use of a hyphen (which should be a dash anyway) in a very short sentence: "however, the reality is - it cannot." A third problem involves tone: noting what "Many people assume" might be at least slightly insulting. Are you, reader, one of those who labor under this mistaken assumption? It would be great if X could cover the cost of Y. But it can't. Notice how much more direct the revision is -- from 16 words to 15, from 28 syllables to 16 (half-price!). And now the writer sounds less like someone writing a ponderous essay and more like someone attempting to persuade an audience. This post is one in a very occasional series devoted to improving stray bits of prose. Computers seem to tempt people to substitute writing for thinking. When they write with a computer, instead of rethinking their drafts for purpose, audience, content, strategy, and effectiveness, most untrained writers just keep editing the words they first wrote down. . . . Drawn in by the word processor's ability to facilitate small changes, such writers neglect the larger steps in writing. They compose when they need to be planning, edit when they need to be revising. Would one guess from the above that this essay was published in 1988? Aside from some details of diction (e.g., "microcomputer"), Grow's essay seems entirely contemporary -- suggesting that the problems of writing with a computer transcend the ever-changing specifics of word-processing technology. Alas, Grow never suggests a return to paper and pencil for planning and drafting, but he does offer other useful suggestions. Perhaps the most obvious -- and difficult -- lesson Proust offers today's readers can be summed up in a few words: slow down, or, in Proust's original French, "N'allez pas trop vite." When the young British diplomat Harold Nicolson met Proust at a party in 1919, Proust ("white, unshaven, grubby," Nicolson wrote in his diary) asked Nicolson how the post-World War I peace conference worked. Nicolson began with a dull summary -- "we meet at 10:00, there are secretaries…" Proust stopped him: "Vous allez trop vite." So Nicolson began again: "The sham cordiality of it all; the handshakes; the maps; the rustle of papers; the tea in the next room; the macaroons." The advantage of not going too fast, Mr. de Botton points out, is that the world has a better chance of becoming more interesting in the process. And more interesting is almost always more fun. "The happiness that may emerge from taking a second look is central to Proust's therapeutic conception," he says. "It reveals the extent to which our dissatisfactions may be the result of failing to look properly at our lives rather than the result of anything inherently deficient about them." From a Wall Street Journal piece by Cynthia Crossen, on Alain de Botton's How Proust Can Change Your Life. Q. Many younger artists discover your work, absorb it, and allow it to influence their own. Are there any new bands that you enjoy? A. I don't listen to much fabricated by the American middle-class. I avoid well-heeled and boogie perspective. I'm more into world-beat, with its time-tested rhythms and higher social calling. Q. What are some words of advice that you would give to young artists today who may be facing Mike Loves of their own who do not understand them and their creations? A. Dance as if no one's looking. Wrestle things out to bring moment to your own sense of discovery, and make the world a better place. This is no time for whiners. That includes Mike Love. "I'll stay in my own private garret, eating my granola and avoiding it all." The New York Times reports today that beards are back, part of a reaction against "men who look scrubbed, shaved, plucked and waxed." "Men both straight and gay," the article says, "want to feel rough and manly." Rough and manly, that's me (see photo right). "It's a nice masculine aesthetic," said Robert Tagliapietra, who with his similarly bearded partner, Jeffrey Costello, designs a collection of pretty silk jersey dresses under the Costello Tagliapietra label. "We both like that aesthetic of New England cabins with antlers on the wall, plaid shirts and a beard." A group of University of Memphis law students are passing a petition against a professor who banned laptop computers from her classroom because she considers them a distraction in lectures. On March 6, Professor June Entman warned her first-year law students by e-mail to bring pens and paper to take notes in class. "My main concern was they were focusing on trying to transcribe every word that was I saying, rather than thinking and analyzing," Entman said Monday. "The computers interfere with making eye contact. You've got this picket fence between you and the students." The Online Computer Library Center, "a worldwide library cooperative," has published a list of the top 1000 titles owned by member libraries. The Iliad and Odyssey both make the top ten, placing sixth and fifth. Homer, you rule. Sample sentence: We power-sat and totally intimidated the server. Will power-sitting routinely intimidate servers? More data is needed. 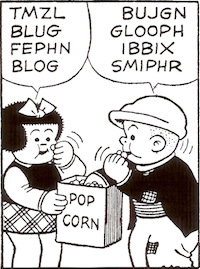 "Aren't you going to put skeptiphobia on your blog?" Thanks for reminding me, Elaine. Sample sentence: The speaker's skeptiphobia explains the lack of time for questions from the audience. The Oxford English Dictionary has no entry for this "word." Google, I suppose, will now have at least one. I'm amused to find two of my abiding interests -- blues and stationery supplies -- brought together in the following lyric of graphitic dysfunction. Blues lyrics are rich in double-entendres -- elevators, jellyrolls, lemons, pincushions, poodles, snakes, switchboards, and wieners, but Johnnie Temple's "Lead Pencil Blues" and Bo Carter's "My Pencil Won't Write No More" are the only blues lyrics I'm aware of that focus on the mighty (or not so mighty) pencil. I've transcribed the lyric of "Lead Pencil Blues" from the recording. Lead in your pencil daddy, just wouldn't write"
Johnnie Temple, "Lead Pencil Blues" (1935). Available on Back to the Crossroads: The Roots of Robert Johnson (Yazoo). 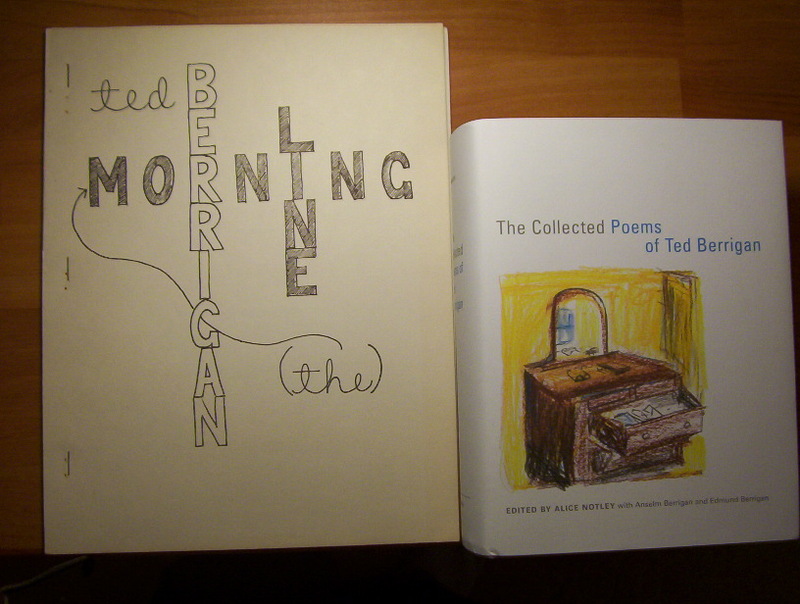 On the left, Ted Berrigan's The Morning Line (Santa Barbara: Am Here Books/Immediate Editions, 1982), 26 pages, photocopied and stapled, published in an edition of 250 copies and 15 signed copies. Note the now-rusting staples. The Morning Line is the last book that appeared in the poet's lifetime. On the right, The Collected Poems of Ted Berrigan (Berkeley: University of California Press, 2005), edited by Alice Notley with Anselm Berrigan and Edmund Berrigan, x + 749 pages. The volume on the right is now on sale for $29.95, 40% off, direct from the publisher. Education theorists have given us two broad caricatures of teaching -- "the sage on the stage" and "the guide on the side." If you know anything about current education, you know that the first is bad, the second good. Yes, the reasoning, like caricatures themselves, is reductive. The first caricature transforms the classroom into a performance venue, the professor strutting and fretting his or her 50 minutes, all eyes and ears attending to a glamorous genius. On this account, any presentation of genuine scholarship and intellectual accomplishment is mere preening: "Who does he think he is? A sage?!" The second caricature imagines a classroom full of highly-motivated, self-directed students, in need of just an occasional correction in steering. This caricature assumes a much greater degree of student interest in "group-work" and the like than is often (or usually?) the case. For many students, "group-work," games, and other "activities" are welcome respites from more difficult work; other students see such stuff as infuriatingly condescending. These caricatures of "sage" and "guide" have little to do with what can really happen in a college class. They erase the possibility of a professor who talks (or professes, as a professor is supposed to do) and leads a discussion -- orchestrating in real time, imperfectly of course, a multi-voiced improvisation on a theme. To my mind, that's the most wonderful sort of class, one whose shape is unpredictable, sometimes awkward, sometimes delightful, and never to be repeated. In light of recent news items about college students messaging and playing online poker during lectures, it didn't seem to me that there could be much debate among academics about the inappropriateness of wireless connectivity in classrooms. But On Campus, published by the American Federation of Teachers, has two profs debating this question in its March 2006 issue. The next time you spot students with glazed eyes peering into a laptop during your lecture, consider a new approach: Ask them to find an online example of a topic you’re discussing and share it with the class. Repeat as necessary with new offenders. That "distracting laptop in class" problem might just take care of itself. I started daydreaming today about how such a strategy might work out. Imagine a class devoted to Book Four of Virgil's Aeneid, the episode of Dido's passion and death. What would count as an online "example" of that "topic"? Unrequited love? Devotion to duty? Royal suicide? Roman marriage customs? (Aeneas notes that he never held the torches of a bridegroom, never really married Dido.) The role of Mercury in Roman mythology? Sword wounds? A map of Carthage? An MP3 of "When I am laid in earth" from Purcell's Dido and Aeneas? An MP3 of the pop singer Dido? I wonder too how quickly a student with glazed eyes would be able to think up a suitable "example of a topic." And were a student to begin searching for one of these possibilties, what would be the point? What are the other students supposed to be doing while the search is underway? And if class simply goes on while the searcher searches (still out of it! ), won't the sharing of the discovery make for yet another interruption of forward movement? Now imagine this sort of interruption occurring with two or three students, perhaps with arguments and protestations of innocence. Allow two or three minutes for the necessary details of identifying each perp, assigning the task, and hearing a brief report. In a 50-minute class, these scattered minutes would eat up roughly 10% to 20% of the available time. I'd hate to be a student intent upon following and learning from a lecture or discussion while my prof's attention repeatedly shifts from the work at hand to students whose minds are elsewhere. A truth that bears repeating: Technology makes it possible to do things, not necessary to do them. It's possible to type a shopping list into a cellphone, but pencil and paper are simpler and more efficient. And it's possible to watch tv while driving, but it's not a good idea. It's, uhh, distracting, just like a wireless connection in a classroom. » Should wireless laptops be banned from the classroom? Polites told me that there was some kind of blow-out today between Achilles and Agamemnon. Rumor has it that it was over some girl. I have a hard time believing that this is true. To be honest, I can’t imagine any girl torn between those two. Agamemnon might be Commander-in-Chief, but there is no kind way to describe his looks. On the other hand, Achilles has to fight the girls off. I swear to Zeus, it looks like a goddamned holiday parade when the guy goes to pick up his laundry. The particular thing, whether it be four pinches of four divers white powders cleverly compounded to cure surely, safely, pleasantly a painful twitching of the eyelids or say a pencil sharpened at one end, dwarfs the imagination, makes logic a butterfly, offers a finality that sends us spinning through space, a fixity the mind could climb forever, a revolving mountain, a complexity with a surface of glass; the gist of poetry. D. C. al fin. But I mean, the main thing, André, is, why do we require a trip to Mount Everest in order to be able to perceive one moment of reality? Is Mount Everest more real than New York? Isn't New York real? I mean, I think if you could become fully aware of what existed in the cigar store next door to this restaurant, it would blow your brains out. I mean, isn't there just as much reality to be preceived in a cigar store as there is on Mount Everest? If you answered yes to these questions, chances are that you have an introvert on your hands -- and that you aren't caring for him properly. Jonathan Rauch's "Caring for Your Introvert" is the most popular piece on the website for the The Atlantic Monthly. The humanities have destroyed themselves over the past thirty years. They were at a height of prestige, along with poetry, when I was in college in the 1960s and in graduate school at Yale from the late 60s to the early 70s. And step by step, through this intoxication with European jargon and a shallow politicization of discourse, the humanities have imploded. You have downsizing of humanities departments and classics departments nationwide. There's hardly a campus you can name where the most exciting things that are happening on campus are coming from the humanities departments. It really is a disaster. . . . What happens when you have the humanities overrun by a certain kind of careerist who really doesn't espouse anything, stands for nothing but a kind of chic nihilism and a certain kind of pretentious discourse. I think that the entire profession is indeed in withdrawal at the present moment. Behold: the new ten-dollar bill. To me, it looks like a GeoCities page. Yikes! The quality of our search and the relevance of our search from a solution perspective to the consumer will be more relevant. Relevance that will be "more relevant"? "[F]rom a solution perspective to the consumer"? Microsoft Word's grammar checker finds nothing wrong with Mr. Holloway's sentence. "He'd tell us, 'Now, 20 rows down, the accounting's hard as granite -- it's the hardest thing an office man can stand,'" said Huddie Ledbetter, one of Peters' former trainees, "'but you keep your pencil sharp, and you keep your pencil working. It's the life of a numbers-crunchin' man.'" Lord, Lord. It's the life of a numbers-crunchin' man. It's the life of a numbers-crunchin' man, Lord, Lord. It's the life of a numbers-crunchin' man. Note that in the post below, I favor writing -- not calculating spreadsheets -- by hand. 1. Writing by hand simplifies the work of organizing ideas into an essay. Compare the tedium of creating an outline in Microsoft Word with the ease of arranging and rearranging on paper, where ideas can be reordered or added or removed with simple arrows and strikethroughs. With index cards, reordering is even easier. 2. Writing by hand serves as a reminder that a draft is a draft, not a finished piece of writing. For many student-writers, writing an essay is a matter of composing at the keyboard, hitting Control-P, and being done. More experienced writers know that an initial draft is usually little more than a starting point. Without the sleek look of word-processed text, there's no possibility of mistaking a first effort for a finished piece of writing. 3. Writing by hand helps to minimize the scattering of attention that seems almost inevitable at a computer, with e-mail, instant-messaging, and web-browsing always within easy reach. Even without an online connection, a word-processing program itself offers numerous distractions from writing. Writing by hand keeps the emphasis where it needs to be — on getting the words right, not on fonts, margins, or program settings. Writing is not word-processing. In some cases, of course, a computer is a necessary and appropriate tool for writing, particularly when a disability makes writing by hand arduous or impossible. But if it's possible, try planning and drafting your next written assignment by hand. Then sit down and type. Thinking and writing away from the computer might make your work go better, as seems to be the case for so many students.